Venezuela is on the brink. Last week Juan Guaidó proclaimed himself Venezuela’s interim president. Nicolás Maduro, the country’s despotic leader, clings on to power. How should the world help Venezuela? On our cover this week Venezuela’s at the brink. A tenth of the population have fled, partly because they’re starving, medicines are running out, inflation is an estimated 1.7 million percent, The election last year was such a fast for the opposition boycotted it. Either the despot Nicolás Maduro falls or he doesn’t – in which case expect matters to get a lot worse in Latin America’s worst governed country. Last week Jaun Guaidó, the leader of the National Assembly in Venezuela, declared himself interim president pending elections. Immediately Mr. Guaidó was recognized by all the important democracies in the Americas apart from Mexico, Canada, the United States, Brazil, Argentina, Colombia. As we’re going to press, hundreds of thousands of Venezuelans are pouring onto the streets demanding that Maduro step down. He’s wrecked the country, he’s wrecked the economy, he’s tortured his opponents, and at least 80% of Venezuelans are heartily sick of him and want him to stand down. The government has always depended on the Armed Forces and on armed vigilante gangs to put down opposition with force and often considerable bloodshed – but it’s running out of money to pay the men in uniform. A major in the National Guard only makes the equivalent of $15 a month – they’ve eat out their salaries by being allowed to steal money or dominate businesses. There’s even a general in charge of toilet paper distribution. The United States ratcheted up the pressure this week by saying that any oil that Venezuela sells to the United States, the money will go to the legitimate government i.e. the one controlled by Juan Guaidó rather than Maduro’s government. That’s a huge deal for Venezuela that’s the source of almost all its exports and it’s very difficult to sell Venezuelan crude oil anywhere else. By putting these sanctions on Venezuelan oil the American government is hoping to starve the Maduro regime of the funds it needs to oppress it’s people. Complicating matters is what one might call the axis of despots – particularly Russia. Vladimir Putin doesn’t like to see autocrats fall and does like to cause trouble in America’s backyard. It’s been reported that a group of Russian mercenaries have been sent to protect Nicolás Maduro. Whether that will be enough to protect a regime that has almost no friends at home, and very few abroad, remains to be seen. 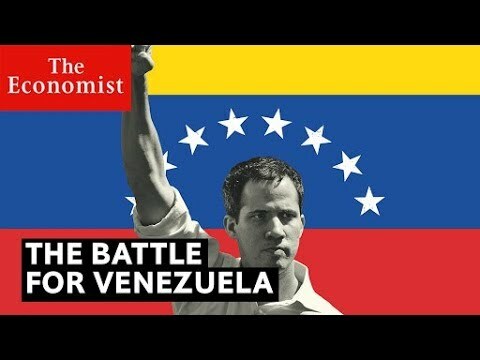 We think the world should recognize Juan Guaidó as the legitimate president of Venezuela because he is, and offer Nicolas Maduro safe passage out of the country – perhaps to a comfortable retirement in Cuba. Once it’s no longer run by an incompetent tyrant the prospects for Venezuela are actually rather good. Within living memory it’s been a sophisticated liberal middle-class democracy. The knowledge of how to build such a society is still there in Venezuela and they could rebuild it again very quickly.